Hey, how are ya? Well, I hope! 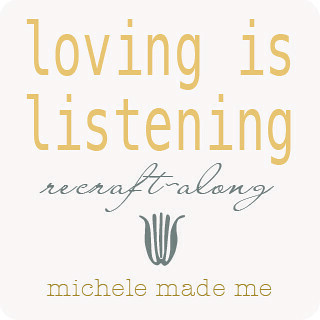 Have you been following along with the Loving is Listening ReCraft-Along? If you’ve missed any of it, here are links to previous posts: Introduction and Part 1 (which includes a list of tools and materials). These should catch you up nicely. By this point, you should have a lovely box decorated with a set of branches. Today we’ll be biting off the next morsel… We’ll be focussing on lettering and birds. Let’s get started! Step 1: Print off copies of the Love is Listening Lettering and the Loving is Listening Bird and Detail Templates. 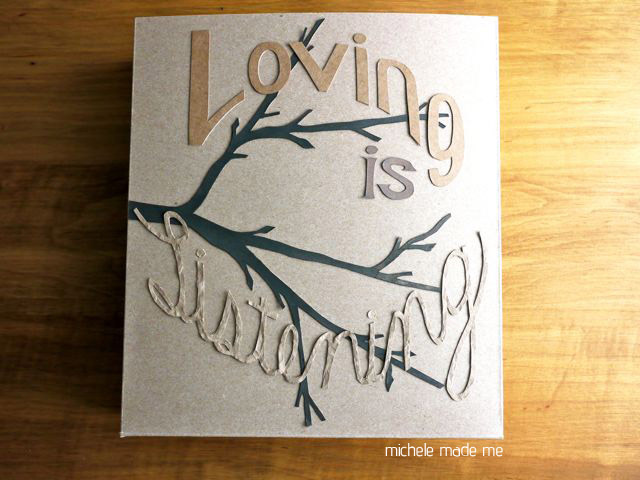 Use the carbon paper to transfer the words “Loving is” onto a dark-shaded cereal or cracker box. Step 2: Cut out the letters using a craft knife or pair of scissors. Remember the big secret I shared in Part 1?… That secret comes in quite handy at this point. It makes the cutting of letters possible with scissors. SO much easier, in my opinion. If you prefer to use a craft knife, remember to protect your work surface with a cutting mat or old phone book. And once you’ve cut out the word “is”, you can apply a light coat of paint to it. I’m using my son’s cake paints for the painty bits of this project. Use what you have available! Step 3: Take out the remaining bit of the scrunched paper bag. Step 4: Transfer the word “Listening” from the template to the paper bag using that carbon paper of yours. Step 5: With your trusty pair of scissors, slowly cut out the word “Listening”. Don’t forget to cut out the dots for the “i”s. Step 6 Optional: I reinforced my “Listening” by glueing it onto the remaining piece of paper bag and cutting the word out a second time. This makes the word doubly sturdy, and much easier to work with. Note that it’s a lot easier to cut out the innards of letters like s, e and g using a craft knife. Step 7: Glue the words onto the base according to the Full Template. Once all letters and words are in place, I like to, very carefully, place a light book on top to make sure everything lies flat while the glue dries. Heep! It’s coming along none too shabbily now, eh? Step 8: Use the Loving is Listening Bird and Detail Template and the carbon paper to transfer the mama bird details onto a medium-shaded cereal or cracker box. Remember the secret? I used it here too. Cut out all the pieces. Use a regular hole punch to punch the bird’s eye out. Be nice though! Step 9: Use the cake paint (or whatever paint you have around) to paint the mama bird bits. I used the colour mauve with varying amounts of water to achieve different shades on pieces 1, 2, and 4. Similarly, I used the colour grey with varying amounts of water on pieces 5 and 6. I left piece 3 as is. Step 10: Use a marker or bit of black paint to colour in the mama bird’s eye on piece 5. Make sure that your eye aligns nicely with piece 6. Step 11: Gather the mama bird pieces and layer them as you would if you were glueing them together. Do NOT glue them yet. Make sure they stack nicely and look good. Make small adjustments now by trimming with scissors if necessary. Once you’re pleased with the look of your bird, glue all pieces together. Place a book on top to ensure the bird dries nice and flat. Step 12: Use the Loving is Listening Bird and Detail Template and the carbon paper to transfer the baby bird details onto two different shades of cereal or cracker box. Cut out both pieces. Repeat this step for a second and even third chick if you like! Step 13: Stack the pieces and glue them together. Step 14: Add the little chick’s eye dot with a black marker. Set aside the mama bird and chickies for now… And remember if you have any questions, don’t hesitate to let me know in the comments. Next up: The Loving is Listening ReCraft-Along nest-building-flower decorating big finish! ♥MAll other “Loving Is Listening ReCraft-Along” posts: Introduction, Part 1, and Part 3 (finish)!